We are celebrating National Literacy Day with the one thing that you truly need: help on how to read crochet charts. When you see a crochet chart, what is your reaction? Do you smile and think, “Hooray! Less text for me to read!” Or do you shudder mentally and skip right to the written pattern? If you shudder, we’re here to help you overcome your fear. Learning how to read crochet charts is just like any new skill: it takes practice and patience. The Love of Crochet spring issue has several projects that let you practice this skill; for this exercise, we’ll focus on Deborah Bagley’s Daisy Chain Mandala (find it here in our store or get the full issue of Love of Crochet Spring 2017). Charts provide a visual representation of the stitchwork, something like an X-ray. 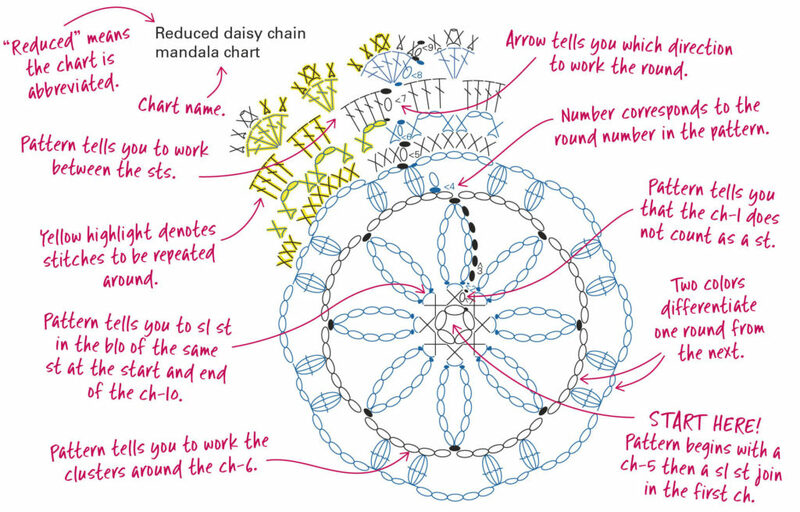 In the Daisy Chain Mandala chart, Rounds 1 through 4 show all the stitches; the remaining rounds are abbreviated, showing only a snapshot of the remainder of the pattern. The chart shows where each stitch is worked, and the stitch key indicates what each symbol means. Refer to the stitch guide or glossary for instructions on how to crochet each stitch. The next things you’ll probably notice, apart from the stitches themselves, are the colors. The chart shows most stitches in black and blue, with a few highlighted in yellow. These colors are important. In a chart for projects worked in rows, black and blue indicate right-side and wrong-side rows, respectively; on in-the-round charts, the colors simply differentiate one round from the next. This chart provides a complete pattern through Round 4 and then shows only a fraction of the stitches used in the remaining rounds. In these “reduced” rounds, some of the stitches are highlighted in yellow: this means that these stitches should be repeated around. For example, in Round 5, the highlighted stitches are six single crochets in the chain-5 space and three single crochets in the chain-2 space. Pro Tip: Read the pattern aloud as you trace the chart with your finger. 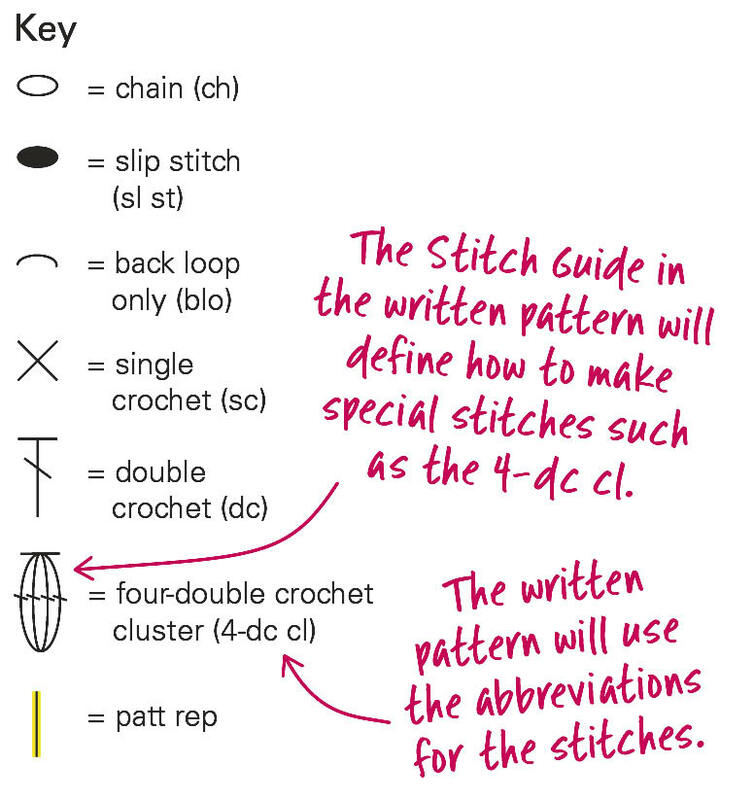 This will help you visualize what you’ll be crocheting and familiarize you with the symbols for each stitch. When you’re working the remainder of this round, you will work six single crochets in each chain-5 space and three single crochets in each chain-2 space. Because you’ll end your repeats in the middle of a section, the pattern includes the last six single crochets you’ll work in a chain-5 space. The remaining rounds of the chart continue in this manner. 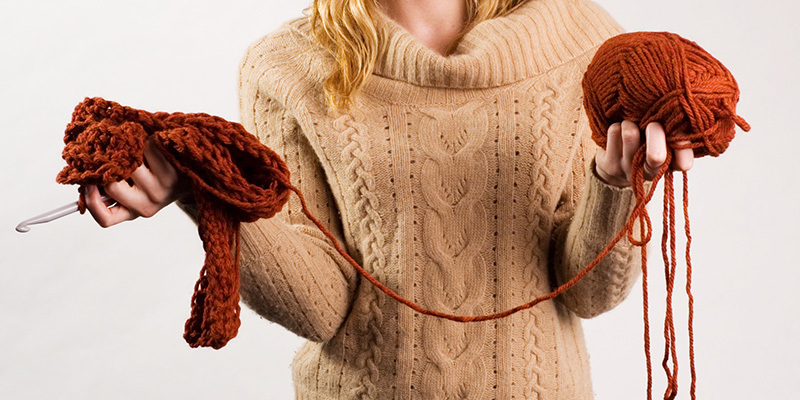 I hope that as you crochet each round, you’ll become more comfortable with following charts. Practice flipping back and forth between the written text and the chart to familiarize yourself with the symbols and understand what the chart is telling you to do. With a little practice you’ll master chart reading, and if you practice this skill with the Daisy Chain Mandala, you’ll also have a pretty wall decoration for your home. Get the Full Issue in Our Store!